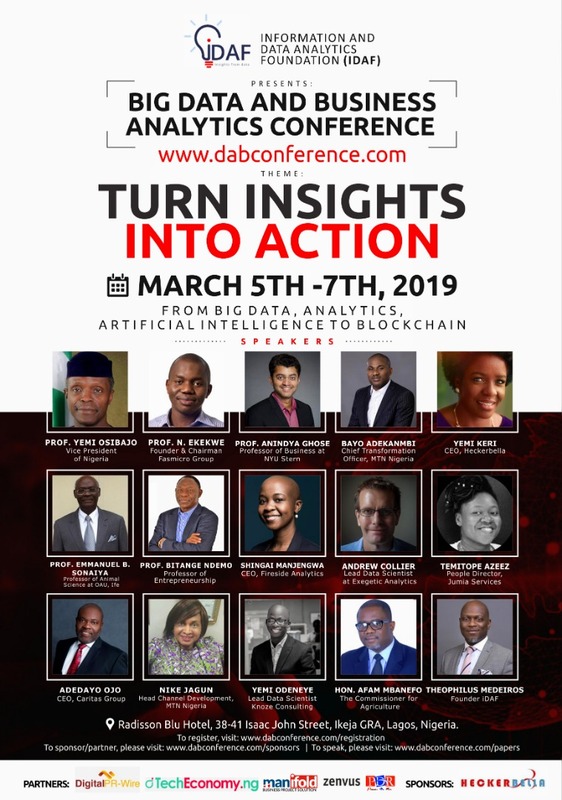 Lagos, Nigeria: February 10, 2019: Information and Data Analytics Foundation (iDAF) has lined up over eighteen speakers for the maiden Big Data and Business Analytics Conference (DABConference). 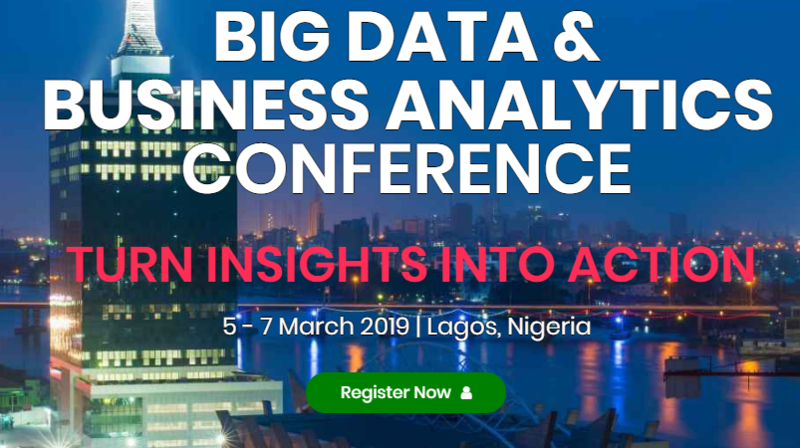 The Conference aims to bring together the leading figures in the Big Data and Business Analytics circle across Sub-Saharan Africa to share insights on leveraging data for strategic business decisions, with Prof. Yemi Osinbajo, Vice President, Federal Republic of Nigeria, as the Special Guest of Honour. Line up of Speakers include; Prof. Emmanuel Sonaiya, Professor of Animal Science at Obafemi Awolowo University (OAU), Ile-Ife; Prof Ndubuisi Ekekwe, Founder and Chairman of Fasmicro; Prof. Anindya Ghose, Professor of Business at NYU, Stern; Yemi Keri, CEO of Heckerbella; Shingai Manjengwa, CEO of Fireside Analytics (Canada); Bayo Adekanmbi, Chief Transformation Officer, MTN Nigeria; Andrew Collier, Lead Data Scientist at Exegetic Analytics (South Africa) and Prof. Bitange Ndemo, Professor of Entrepreneurship (Kenya); Ugwem Eneyo, CEO Solstice Energy Solutions; Hon. Afam Mbanefo, Commissioner of Agriculture, Anambra State; Theo Medeiros, Founder of iDAF. Others are Adeyemi Odeneye, Lead Data Scientist; Temitope Azeez, People Director, Jumia Services; Tony Ayabam, CEO of Infohob; Adedayo Ojo, CEO of Caritas Group amongst other speakers. “The primary objective of the DABConference is to discuss ways businesses can take advantage of their data as intellectual property to make informed strategic business decisions. It is time for business leaders and policy-makers in Africa to shift from intuition-based decisions to making data-driven decisions that align with organizational strategies” Medeiros explained. The Conference, according to the Lead Convener, will include panel discussions, workshops, executive network cocktail, Hackathon and exhibitions from brand and stakeholders. The conference hosted by iDAF in partnership with DPR, ManiFold, DigitalPRWire, TechEconomy.ng, provides an opportunity for brands to showcase their products and services to over 1000 participants expected at the event while registration has started at the website – dabconference.com. Surprised that Kazeem Tewogbade CEO of BlueChip isn’t a top speaker? When Kazeem talks, I listen very carefully to everything he says. Yes, he is a master of Data!